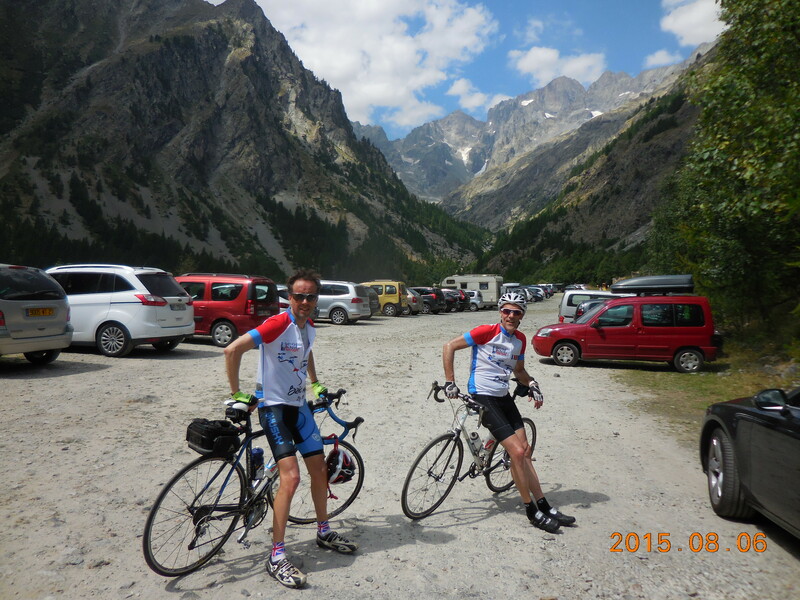 Read this page for a lot of background information about cycling in the French Alps. Supposedly the hardest climb in the Briançon area, the Col du Granon is about 11.4 km and 1,053 meters (3,455′) of climbing from Saint Chaffrey. A lovely climb with a fun descent, it starts steeply and continues steeply. The upper half feels totally relentless and brutal. Just to whet your appetite, here is what 100GCC says about it, “There’s no rest, no break – just endless, unrelenting punishment across a harsh, featureless but beautiful mountainside.” To get to it, go up the road towards the Col du Lauteret and turn right into Saint Chaffrey. Go through the town and a few hundred meters past the end of the town turn right, following signs for the D234 and the Col du Granon. There seems to be a little confusion about the name of this col. 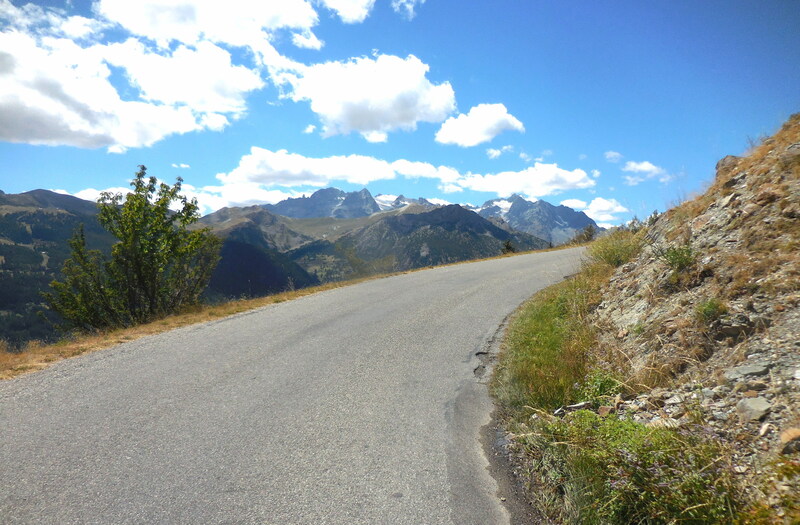 Most signs call it the Col d’Izoard, but some call it the Col de l’Izoard. Regardless of the name, it’s a famous climb, often used in the Tour de France. From the north, it’s about 19 km and 1,100 meters (3,609′) of climbing. The climb starts right in town, by the roundabout next to the downtown area. It’s a pleasant climb, worth doing if you can only do the climb from Briançon, but it suffers from the south side being far superior. From the south, a dramatic climb with some stunning views. Starting where the D902 and D947 intersect, it’s about 14.5 km with 1,000 meters (3,281′) of climbing. The whole climb is good, but the most dramatic section happens about 3 km from the top when you see the bleak, spectacular Casse Déserte. This is really what makes the Izoard so incredible. If you can only do one side, do this side. Another option is to do what I did, and start in Briançon and go up and over, then back. 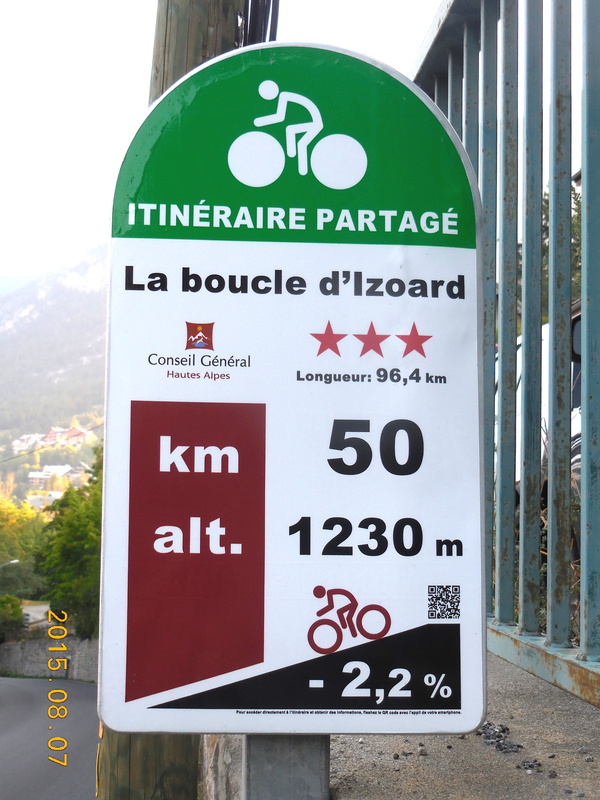 A further option is to do a loop, La Boucle d’Izoard. It officially starts in Guillestre but obviously you can start in Briançon. It goes counter-clockwise, so you’ll climb the south side of the Izoard. There are kilometer markers all the way, and where there is an intersection with a decision there will usually be a small sign with a bicycle pointing the correct way. The key is to find the D36 heading south through Le Villaret. From the north, starting in the town of Ville Vieille, it’s about 20.5 km and 1,320 meters (4,331′) of climbing. It’s a lovely climb in a beautiful valley. About 6 km from the top, the road switchbacks up from the valley floor and the real climbing starts, with the views getting increasingly better as you near the col. 100GCC says, “Your surroundings are simply incredible – if your mouth weren’t already locked open gulping in oxygen to feed your muscles, it would be gaping through sheer awe.” And this is just the north side – the south side is far more awesome and incredible. From the south, starting in Casteldelfino, it’s about 20 km and 1,350 meters (4,429′) of climbing. There is some steep climbing to start, then the gradient eases off considerably and is even flat in places. In fact, one might argue that the first 10 km are not worth doing. The reason for this is that the last 10 km are what really make this climb. It’s a monster, ferociously steep and sustained, and dramatic and beautiful. One of the hardest climbs around. I did both sides, starting in Ville Vieille, but unless you have a real desire to go to Casteldelfino I’d recommend turning round at the base of the steep climbing on the south side, about 10 km from the top. There was even a sign by the road claiming this was the “start” of the climb. About 19 km and 1,100 meters (3,609′) of climbing from the roundabout in Guillestre where the D902A heads left to Chateau Queyras and the D902 heads right to Vars. A wonderful and very varied climb in a very pretty valley. It starts steeply from Guillestre then evenually levels off, before climbing again through the ski area of Vars Les Claux, then easing off towards the summit. About 23 km and 979 meters (3,212′) of climbing from L’Argentière-la-Bessée. A beautiful ride with stunning views. It’s not as hard as some of the big passes, but it’s hard enough, and the end of the valley is simply spectacular. After the camping area of Aile Froide the road surface is less smooth and so the climbing becomes more difficult until you reach the flat area just before the end of the road. The end of the valley has a lovely cafe where you can replenish yourself, and is a very popular hiking area. Depending on the time of the day there can be a lot of traffic on the road. Extra Credit: From the town of Vallouise, ride west though Le Villard to the end of the valley and another hiking area with spectacular views of the mountains. This is not as beautiful a ride as the ride to Pre de Madame Carle, but it’s steep and difficult in the latter part. It’s about 8.5 km and 470 meters (1,542′) of climbing to the parking lot at the end of the road. 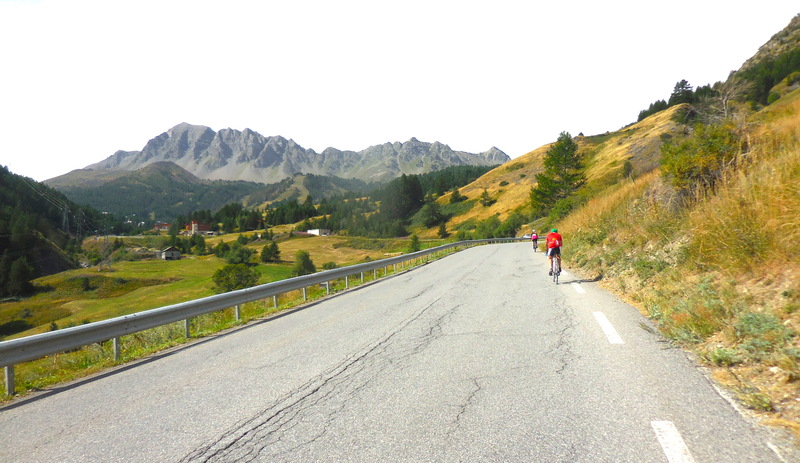 The Briançon side of the Galibier, from the Col du Lauteret, is a short but very scenic ride. Riding to the Col du Lauteret is not so much fun as it’s a long, gradual climb with quite a bit of fast moving traffic. 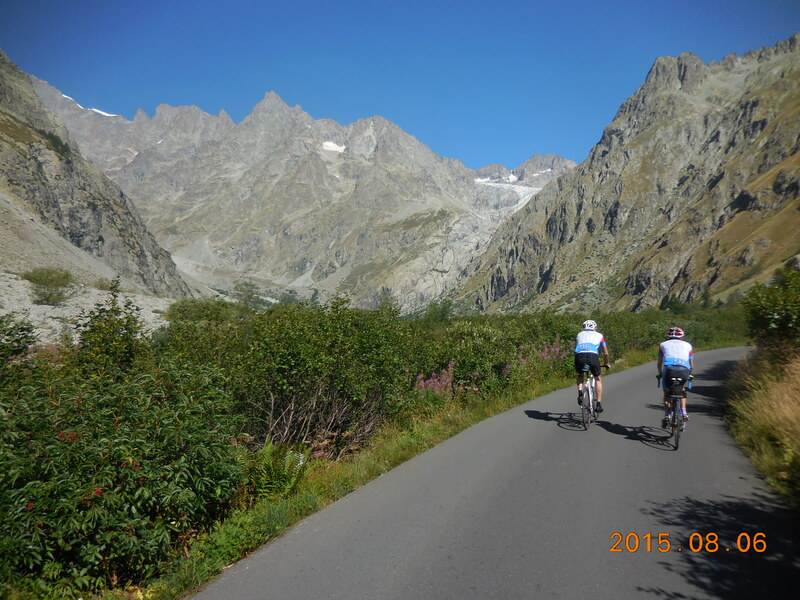 If you just want to do the best riding, without worrying about ticking off climbs, drive to the Col du Lauteret then ride up the Col du Galibier, ride down the other side to Valloire, then retrace your steps back to the Col du Lauteret. That way you’ll get the best of both sides of the Galibier.